Randall Grahm is iconic. 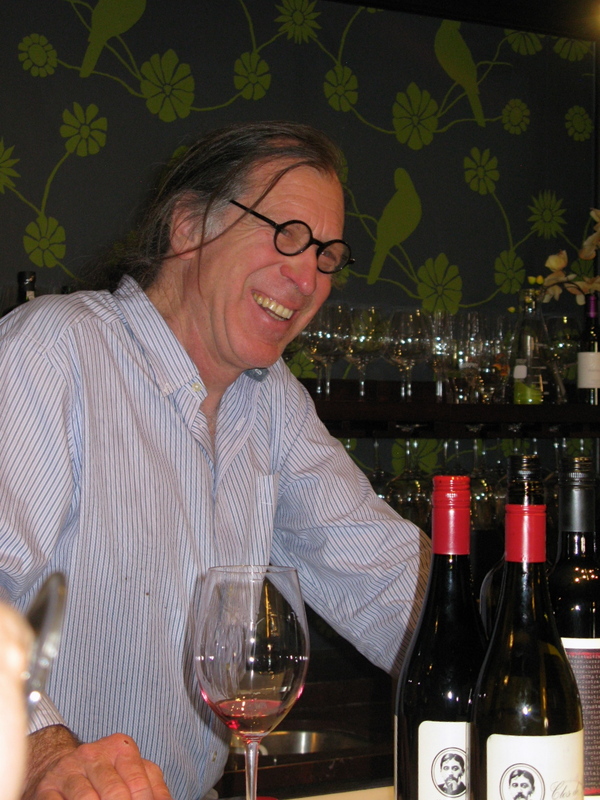 He is a piece of any discussion of the history of California winemaking. Known as the original “Rhone Ranger”, it all started from his desire to create the perfect pinot noir and believing it could be done in the Santa Cruz Mountains. He began with a thirty-acre parcel in the small burg of Bonny Doon, sharing its Scottish heritage with the other small enclaves like Ben Lomond, Loch Lomond and Scott’s Valley, which have been part of the Santa Cruz Mountains persona forever. He still loves the mineral elements and austerity of the great Burgundian wines, but is best known for introducing Rhone varietals and blends to California with Grenache, syrah, mourvedre, cinsault and others. The diversity of his palate, along with a willingness to take risks in the name of creativity has afforded Randall an adventurous appeal with wine lovers over the years. Having chosen to divest myself from the restricted nature of most wine clubs, I am proud to have been, in good standing, a member of the Distinctive Esoteric Wine Network (D.E.W.N.) for nearly twenty years. With good wine as a given, Bonny Doon Vineyards will often introduce me to new varietals and blends, often produced from vineyards in the most obscure locations, each with a story brought to life through Randall’s arcane tasting notes, carefully selected labels and screw cap bottles, that he fervently contends are superior to cork. I enjoy his newsletters knowing that they will require multiple readings to fully comprehend. Reading them with a glass of wine helps. An opportunity to taste some current Bonny Doon releases with Randall brought me to Monopole Wine in Pasadena on a Tuesday evening. Always embracing variety and pushing some envelope, no two Bonny Doon tastings are alike and while most of the selected wines were familiar, this one would be special. If you like pink or “salmon” wines, this is a must. Some time ago, as a loyal D.E.W.N. 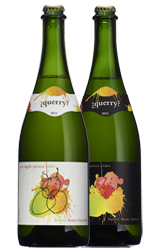 member, I was sent two bottles of something called “Querry Cider.” Admittedly not a fan of hard cider, this one was of interest not only because it was sparkling but also comprised of natural pear, apple and quince, fermented in their natural yeasts. Quince is a small pome fruit from a deciduous tree that resembles a pear and taste like a “pearapple”. with pleasant earthy, mineral nuances. San Francisco Chronicle Wine Editor Jon Bonne’ described the 2012 Bonny Doon “Clos du Gilroy” ($20) as “uncomplicated delicious” while Wine Spectator magazine called it one of “10 Bold California Reds” with a rating of 91 pt. Actually coined as “the wine formerly known as Clos Du Gilroy”, the grapes for this Grenache (75%), syrah (17%) and mourvedre (8%) blend now come from the Alta Loma vineyard in Greenfield, CA and vineyards in Santa Maria and the Sacramento Delta. There is nothing ordinary about the 2011 Bonny Doon “Contra” ($18). Firstly, it primarily consists of old vine carignane from the Sacramento Delta communities of Antioch and Oakley in Contra Costa County, east of the San Francisco Bay. These are hardly recognizable vineyards unless you are searching for carignane and mourvedre vines in California. 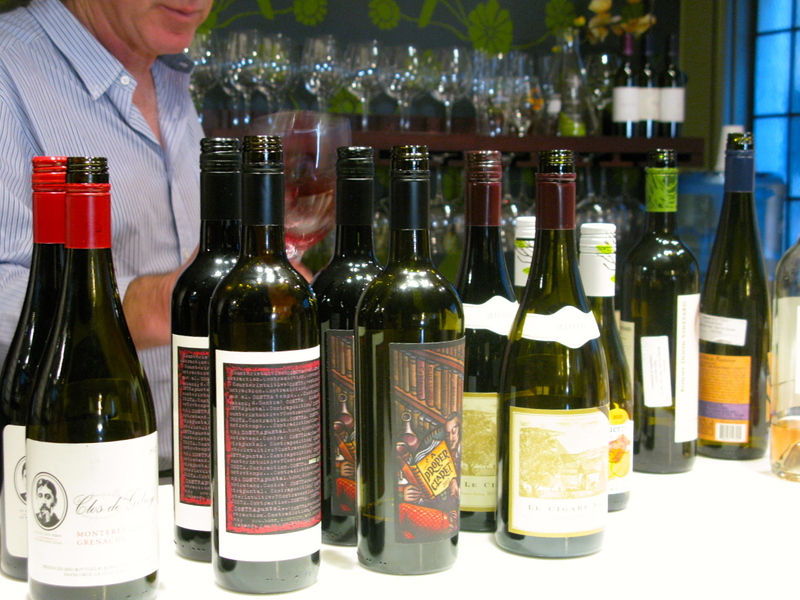 Secondly, the careful selection of secondary grapes is an education of diverse California appellations in one bottle. array of grapes from Monterey County, San Luis Obispo and the Santa Maria Valley. The concoction is mixed together with some oak chips in stainless steel tanks. The result is a complex, reasonably priced red wine that will stand up to red meats, even spicy BBQ ribs and, as we were reminded, “all Bonny Doon wines pair well with pork products.” This wine is very drinkable now with some decanting, but Randall estimated that it could age well for another 12-14 years. “Claret” is the English word for “Bordeaux,” an alien blend to Bonny Doon, produced here through Randall’s predilection for a more austere wine. He declares that “there is this false belief that new Cabernet Sauvignon from Napa Valley must be 14% alcohol,” defending his “anti-fruit bomb” stance in favor of wines, lower in alcohol, that work better with food. nice licorice quality that can be enjoyed now. An abnormally high ration of petit verdot enhances the silky texture and floral hints while the tannat, native to the French Basque region, adds tannins to repress and balance the dominant cabernet sauvignon. This is an exceptional wine for the price. Known as their flagship wine, the 2009 Bonny Doon Le Cigare Volant ($79) and its predecessors, have carried the “State of the D.E.W.N.” message since the first vintage in 1984. A classic Rhone blend of syrah, Grenache, mourvedre and cinsault, Randall abandons all decorum when he describes it as a “Burgundian Chateaunef du Pape” (Rhone Valley) wine. He explains that wines from the Burgundy region have more feminine qualities, perfumed and floral and both are present here. The “batonage” process allows the juice to mix with the yeast lees, giving the wine a silky texture and earthiness. It’s extended time in the bottle gives balance and length that can be enjoyed now or for years to come. The prominent labels pays homage to an actual 1954 local ordinance that prohibits all flying saucers or “flying cigares” to penetrate any air space over the vineyards of Chateaunef du Pape. To date, the ordinance has worked. Not part of this tasting, I highly recommend any of Bonny Doon’s four single-vineyard 100% syrah from the highly respected vineyards, Bien Nacido, Alamo Creek, Jespersen and Chequera. Every wine tells a story, but most from Bonny Doon are like novels, revealing some little known varietal originating from a strange vineyard or appellation, delivered with humor, wit and the passionate skill to make it a bestseller. 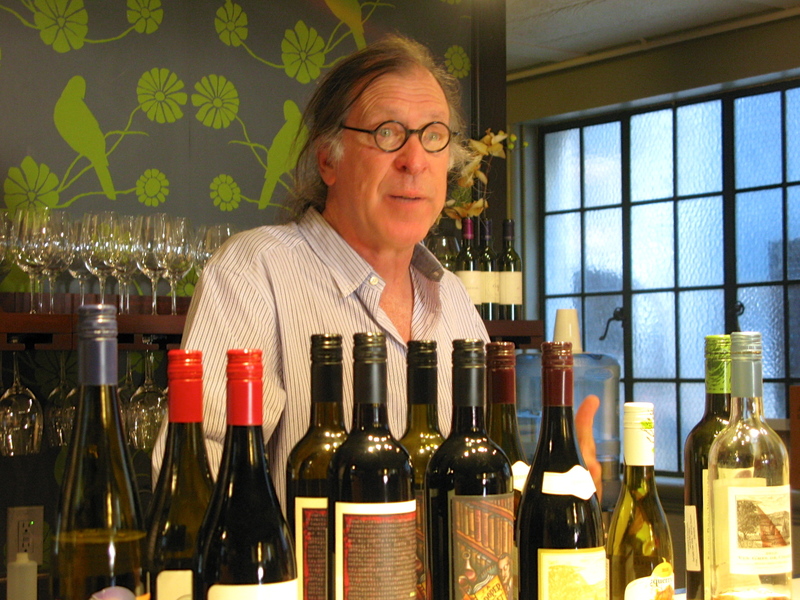 Feeling the need to get beyond varietal wines, Randall Grahm lives by his credo that “we need to make original wines…we will never get it as good as the Old World.” I think we can get close. This entry was posted on Friday, April 18th, 2014 at 9:17 pm	and tagged with Bonny Doon, Bonny Doon Vineyards, Grenache, Randall Grahm and posted in Wine. You can follow any responses to this entry through the RSS 2.0 feed.